Long narrow pendant with scale like moving parts, joined to a silver chain with 25mm length links. Pendant with matt and polished surfaces. 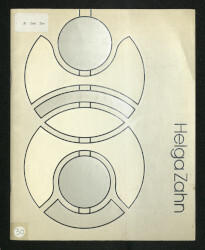 Necklace, Helga Zahn, 1968-71, Crafts Council Collection: J21. Photo: Todd-White Art Photography.